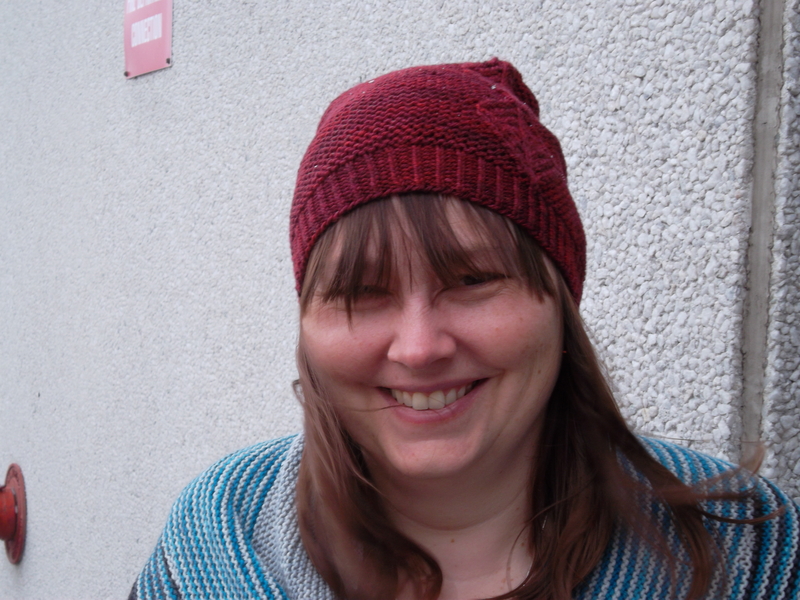 A while ago, my friend Meghan, a knitwear designer came up with a new cowl pattern she needed test knit, followed closely by a matching mildly slouchy hat. Seeing how I needed a hat quite badly (I am one of the worst examples of the shoemaker’s kid going barefoot when it comes to hats and mitts) I figured I’d take care of two things at once. I grabbed a skein of Tanis Yellow label and cast on. This plan, gentle readers, did not work so well for one main reason, If you reference my post of earlier this week, hats (beanies especially) and I do not get on. This hat was the final illustration of that most disappointing truth. Additionally, I seem to have somewhat of an issue with left and right twists as they pertain to knitting charts, and instead of Meghan’s lovely leaf pattern she designed, my hat has diamonds. Pretty diamonds, but diamonds nonetheless. I went out and purchased a set of highlighters for any future chart work. My friend, Atoy, for whom I have knit two different hat and cowl sets has laid claim to this one, too (it looks pretty nice on her, too!). I fully expect for her to ask for the matching cowl, but she will have to buy the yarn because this slouchier version took up over 2/3 of the skein! Pattern: Etched by Meghan Jackson (not yet in Ravelry). Yarn: Tanis Fiber Arts Yellow Label DK in Garnet. This colourway is very pretty…lovely red tonal. In fact, I will likely never buy Poppy again. Who Was It Made For? Me originally….but it did not work out. Were There Changes Made To The Pattern? One that was intentional (I added a third repeat) and one that was not (the leaves became diamonds). Did I Learn Anything New? I learned that I need to pay WAY more attention to charts where twists are concerned, but no new skills. On the plus side, now that I have picked up the cowl again, languishing in my WIP pile since Christmas, I know I will get it right. Anything Else? No. Moves yet another skein of yarn into the Stashdown2013 pile, which is very happy-making. Would I Make Another? : I might, but sadly not for me. Hahaha! I had not looked at it quite like that! And thank you…I love the hat…just not for me, which made me very sad.